The trustees of Purdue University have elected Governor Mitch Daniels as the 12th president of Purdue, following a nearly year-long search. Daniels will begin his tenure as university president in January 2013. 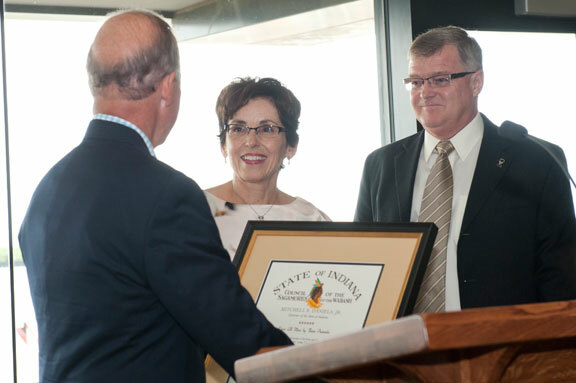 I know I join Purdue supporters at home and around the globe in welcoming Governor Daniels as our newest Boilermaker. Mitch Daniels was elected Governor of Indiana in 2004 and reelected in 2008. He was the director of the Office of Management and Budget for a time under President George W. Bush and a senior aide to President Ronald Reagan. Before his public service he worked in the private sector as Senior Vice President at Eli Lilly and Company, Indiana’s largest corporation. He is a graduate of the Woodrow Wilson School of Public and International Affairs at Princeton University and has a J.D. from Georgetown University Law Center. He is the author of the book "Keeping the Republic: Saving America by Trusting Americans." Governor Daniels is highly respected in Indiana and the nation for his efforts during the recent recession to keep the State budget balanced. He simultaneously maintained a healthy budget surplus. He introduced efficiencies in governance and attracted business to the State. The Governor sees universities as important engines of innovation and economic growth. One of his top goals for education is to increase the number of college graduates. He has been supportive of Purdue’s planning for year-around schooling as a way to accelerate time to degree. About Purdue's trimester plan he has said, "Purdue has moved boldly to become more productive, affordable, and supportive of students more quickly completing their degrees." He has been a vocal supporter of online education, which is important as Purdue expands the scope of its online content and its access to global citizens. Purdue relishes its role as a top engineering and agricultural school with distinguished arts, humanities and science programs. Daniels has hailed Purdue as providing "the critical intellectual building blocks of a winning national economy." Purdue is the home of faculty members who have recently been awarded a Nobel Prize in Chemistry, two World Food Prizes, and two National Medals of Technology. Governor Daniels has said that the quality of Purdue's faculty is its strength. He is committed to excellence in the faculty ranks and will continue to hire and retain talented faculty members. He understands the value of superb staff, having hired many in his diverse leadership roles. Like all of us in the academy, he delights in our terrific students. He will cherish their creativity and energy, and listen to and respect their ideas. The challenges faced by public research universities today are great. Governor Daniels will bring a fresh perspective to these challenges. His creative thinking and skill in the legislative arena will be vital as Purdue continues to make its case for State support of its core programs. Purdue is fortunate to have found a focused, experienced leader in Mitch Daniels. And Governor Daniels is fortunate to join a committed, hardworking team of administrators, faculty, staff, and students. I would like to take this opportunity to thank our wonderful students and our talented faculty and staff. I have learned so much from each of you, and enjoyed all of our interactions. My husband Chris and I have loved living in this amazing community.